Rotator cuff strengthening exercises are important to prevent rotator cuff problems due to muscular imbalances. The videos below provide a few exercises you can use to strengthen your rotator cuff muscles. 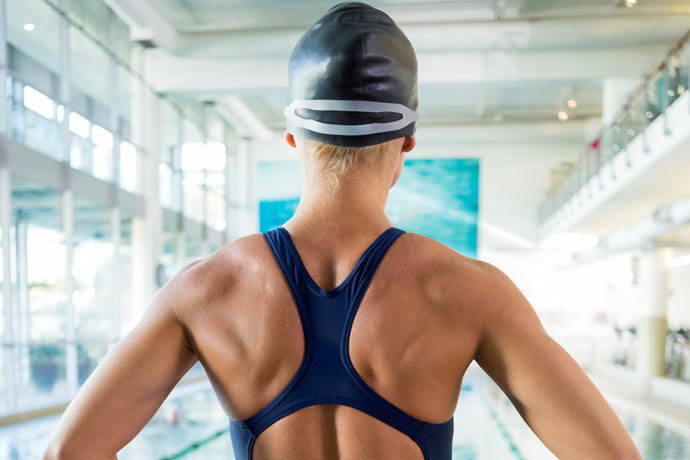 Overtraining and poor swimming technique can lead to muscle imbalances and result in shoulder pain at the rotator cuff, a condition which is also known as swimmer’s shoulder. To avoid swimmer’s shoulder, it is recommended to do shoulder strengthening exercises for the different rotator cuff muscles, which are the Supraspinatus, Infraspinatus, Teres Minor, and Subscapularis. Those muscles allow the arm to rotate internally, rotate externally and to abduct. But they also press the head of the humerus against its socket by contracting all at once shortly before the arm starts to move. This rotator cuff exercise strengthens the shoulder’s external rotators (Infraspinatus and Teres Minor muscles), which are often much weaker than the internal rotator muscle in swimmers. Lie on the side, top arm at your side with a light dumbbell in hand. Support the head with the other hand. Keep the elbow of the top arm at your side, and angle the forearm at 90°, with the palm facing down. Now lift the forearm as far as possible by external rotation of the shoulder, then bring it back down. The elbow stays close to the rib cage. Do between 10 and 20 repetitions. This exercise can also be done standing using a stretch cord. This rotator cuff strengthening exercise targets the shoulder's external rotators (Infraspinatus and Teres Minor muscles), which are often much weaker than the internal rotator muscle in swimmers. This rotator cuff exercise strengthens the internal rotator of the shoulders (Subscapularis muscle). Hold a light dumbbell in the hand of the lower arm. Keep the elbow of the lower arm close to your side, and angle the forearm at 90°, with the palm facing up. Now lift the forearm as far as possible by internal rotating the arm, then bring it back down. The elbow stays close to the rib cage. This rotator cuff strengthening exercise targets the internal rotator of the shoulders (Subscapularis muscle). This rotator cuff exercise strengthens the shoulder’s abductor, the Supraspinatus muscle. Lie on the side on the floor. The top arm lies along the side of the body with a light dumbbell in hand. The other hand supports the head. Now lift the arm sideways until it is at an angle of 45°, then lower it again. This rotator cuff strengthening exercise targets the shoulder's abductor, the Supraspinatus muscle. 1) The exercises should be done three times a week, with at least one day off between each workout to allow the muscles to recover and grow stronger. 2) The exercises should be started with small weights (2-5 pounds) or with low resistance stretch cords. The rotator cuff muscles are small, and that’s why you must target them with small weights. 3) The exercises should be done in 1 set that comprises between 10 and 20 repetitions. Doing several sets doesn’t bring any significant advantage. Increase the weight or stretch cord resistance once you can do 20 repetitions with correct form. 4) Don’t lift the dumbbells too fast. Hold a comfortable, steady rhythm, about 2 seconds to lift a dumbbell and 2 seconds to lower a dumbbell. 5) If you do swim or work out the same day, do the rotator cuff strengthening exercises after the workout. You don’t want to swim or work out with tired rotator cuff muscles as this could lead to injury. I like these exercises. Please add some new workouts. Excellent rotator cuff strengthening exercises.